Relocating a complete security filter to a mezzanine floor is not a task you can complete all at once. A few security lanes at a time will be out of operation throughout the mezzanine construction. Since we cannot really do without them, we have decided to build a temporary security filter to accommodate the flow. To guarantee optimum security checks throughout the renovation, we will create a temporary security filter with eight lanes and CT scanners. 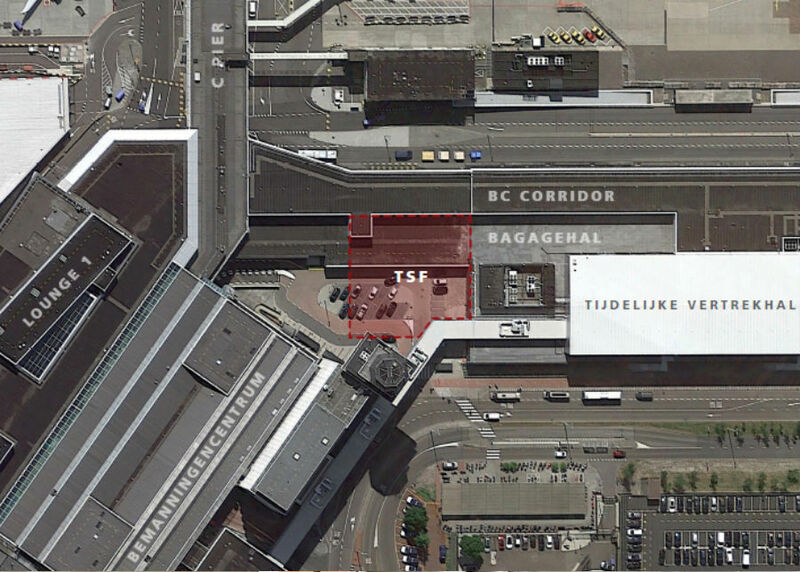 This filter will be on the first floor of the airport, at the site of Cockpitplein (between Skyport and temporary Departures 1A). We will be making a special passage to the temporary security filter in the corridor that connects Departures 1 and 1A. After the security check, passengers can continue to their respective piers via the BC corridor. The temporary security filter will be open from 1 June 2019.